But did Beats pay the fine? Remember that time the NFL said players shouldn’t be caught wearing Beats by Dre headphones before, during or after games because the league’s ears belong to Bose? Colin Kaeperneck tried it and got fined. After a game on Sunday, Kaepernick wore a large pink pair of Beats headphones to a press conference. (The headphones are pink for Breast Cancer Awareness Month.) For the infraction, Kaepernick was fined $10,000. But is this all a part of a Beats PR plan? ESPN asked Kaepernick whether Beats paid the fine on his behalf. The player’s response? “I’m going to let that be unanswered.” What? 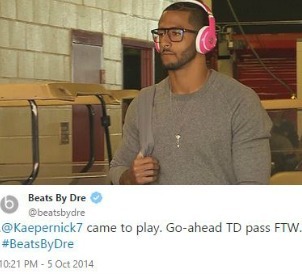 And here’s photo on the Beats timeline of Kaepernick wearing the offending headphones. If you scroll up through the timeline since the 5th, you see Cameron Newton, Richard Sherman, Earl Thomas and Kam Chancellor in photos all wearing the headphones. 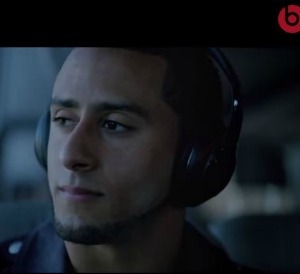 Sherman and Kaepernick have appeared in Beats commercials. Kaepernick had to know about the ban. We wouldn’t be surprised if he even had an individual conversation because of his relationship with the brand. We said that it would be something kind of incredible if Beats managed to maintain its presence despite the contractual hurdles. There’s a lot of money at stake, and perhaps $10,000 isn’t a lot to spend to stay on the field some way, somehow.